With a professional website, in just a couple clicks you can present a professional appearance online for all your tenants and owners. Instantly showcase your available rentals. Your property management website is fully integrated with your software to quickly publish vacancies, allow tenants to pay rent online, and give tenants and owners one-click access to their portals. With our easy website editor, you can quickly update or change content on the site with only a few clicks. No expensive web designers to hire, and no hosting fees to pay. It's free with Rentec Direct. A custom web address. 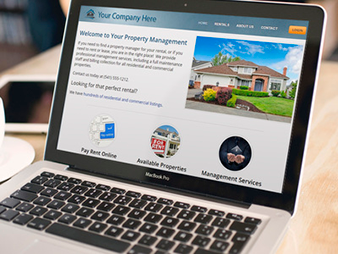 You can use our propertymanage.biz domain and pick a custom address like “choicepm.propertymanage.biz”. If you own a domain (like www.choicepropertymanagement.com), you can also point it at your website and we’ll host that as well. Fully customizable pages, plus all your property listings. We provide you with a home page, an about us page, and a contact page. We provide you an easy template which you can use, or you can replace the contents of the page with anything you like. The editor accepts HTML and CSS code, so you can be as creative as you want. Multiple mobile compatible themes. Every theme is designed using responsive web design to ensure compatibility with every mobile device. This will help you attract more clients, and rank better in search engines for your area. Google Analytics support. Provides you with the best in class reporting on who is visiting your website, where they are coming from, and what they are looking at.